Here’s one of my favorite pieces of needlework. 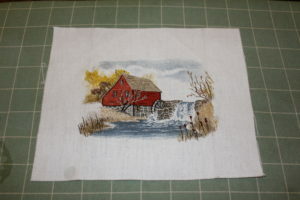 It is called “Mill Pond” by Cathy Needlecraft, from an original watercolor by Rudy Ravasio. I love scenes like this; quaint old buildings especially in an autumn setting. “Mill Pond” by Cathy Needlecraft. For some reason, this took a couple of years to stitch, but it was worth it!